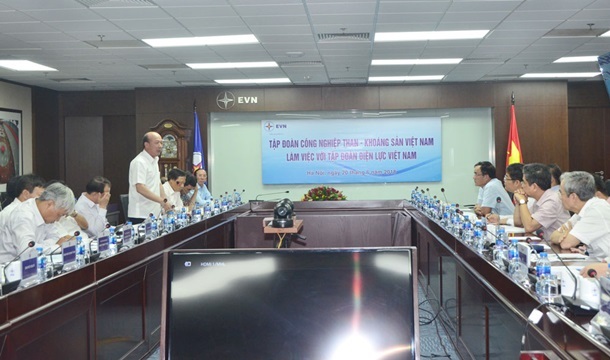 The leaders of Electricity of Vietnam (EVN) and Vietnam National Coal and Mineral Industries Holding Corporation (Vinacomin) had a working meeting to discuss activities on ensuring coal for electricity generation. The leaders of EVN and Vinacomin have affirmed to continue the sustainable cooperation to ensure national energy security. At the meeting, leaders of EVN and Vinacomin affirmed that the long-term traditional and sustainable cooperation to supply coal for electricity production recent years, has contributed to ensuring national energy security. In coming time, EVN and Vinacomin will build a long-term coal supply contract, focusing coal quality, cost, transportation methods, etc. Especially, EVN and Vinacomin will set up an executive team that carries out periodic hand over to the next shift by every quarter to timely remove difficulties and problems in the cooperation process. On the other hand, two sides will continue to promote the application of information technology in cooperation activities between them. In particular, it is necessary to emphasize that EVN has developed a software to supervise the activities of coal regulation, and EVN asked Vinacomin to coordinate in controlling the situation of supplying and receiving coal for electricity generation through this software. At present, Vinacomin and North East Corporation provide thermal power plants of EVN with about 25.93 million (with the most amount of Vinacomin).